I chose this because in Catholic teaching men and women are of equal dignity. We are partners, we are part of the Church Militant, and we live this life in a spiritual war zone. We NEED to be a team, but like in military situations, our spiritual lives depend on the bond, the special connection. He leads, but wives, we are his second! We have his 6! This is not some soft task. Are you an assertive leader at work? A go-getter? Is he more laid back? You have his back, what are his strengths? Contemplate them, then get out of his way as he does his thing–and you have his back. It may be a woman thing, this ability to discern. We track and arrange so much but I don’t think it was a mistake that God called Eve a helpmate for Adam. We know she took the lead and failed to have Adam’s back. Look at Mary. She was not passive, she thought on everything, she said yes to God. She called herself a handmaid. Yet she wove Jesus’ tunic in a single piece! That is skill people– she could work a loom complex enough to allow a garment to be woven without seam! That was so high quality the soldiers gambled to see who got it. She clothed God incarnate. She also nudged Jesus at the wedding at Cana to fix the wine situation. She followed even to the cross, and did not waver. She had his back to his death–and there were more women at the foot of the cross than men. God called the shots, but Mary had Jesus’ back. Think about the Proverb’s 31 woman. Talk about a go-getter, strong, leader! She made it possible through her brilliant management for her husband to do what he did. She was his second, she had his back, and because of her gifts in action, he could sit at the gates with the elders. Our modern use of the word “submit” is miles away from this! You want to rock the entire, “wives submit to your husbands” scripture? Reframe it to, “I am my husband’s second, I have his back.” and let yourself discover with prayerful discernment what that means in your specific marriage and home. I am very happy with the allergist. I was referred by my primary care doctor, and as I had no preference, I took whomever had an opening. The nice lady told me to go off all my allergy medications if I wanted to be tested, and I was tested, and to my surprise I have a LOT of allergies. More than I remember from the testing 20 some odd years ago. So we have an initial plan of saline washes twice a day, allergy nasal spray twice a day, anti-swelling spray twice a day, and see how my voice and body handle it. I have no idea how it will go. If this isn’t enough to get a consistent control of symptoms, we will look at shots. AND it turns out the tightness in the chest is asthma from allergies- another allergic reaction. So that may need to be treated separately. Mostly it only bothers me when I am outside during high pollen periods, and then I cannot exercise without being miserable. It may be why my exercises to increase my breath control for Ventriloquism are only having some impact. Voice training isn’t going to cure swelling due to allergies. I am on the journey to keep up my voices and become able to schedule a show and know that I can do it! Dear Lord, Thank You for modern medicine! Give wisdom and insight to doctors. Help me to comply with doctor’s orders and successfully avoid infections and loss of voices. +Amen. 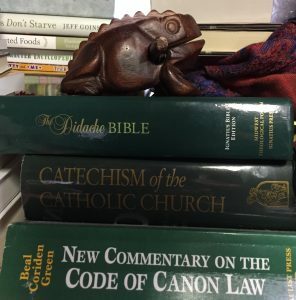 The frog helps to prevent other books from being placed on top to annoy me when I reach for my Bible. That is THE DIDACHE BIBLE put out by Ignatius Press in partnership with the Midwest Theological Forum. The translation is the RSV-CE, considered by many Catholic scholars to be one of the finest translations for study. 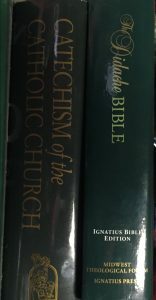 I like that it has lots of footnotes to Catholic teaching, with the use of the CATECHISM OF THE CATHOLIC CHURCH. The CCC as we often call it, is a concise rendition of Catholic Teaching. The basics! We need to return to basics often. There are other “catechisms” but this big one is a major gift to the lay person! I keep my NEW COMMENTARY ON THE CODE OF CANON LAW handy not so much because I reference it all that often anymore, but because if I do need to check on something I have it handy. I do not think anybody really needs one of these, but I like having it, and other books not kept right at my desk, because I geek that way. Are the two best investments to learn the Catholic Faith. Dear Lord, thank You for good study Bibles and the excellent Catechism of the Catholic Church. Please help us to reference them often and learn to know and internalize the faith in our every moment. +Amen. 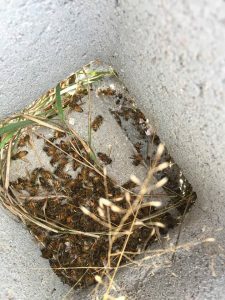 Our colony of bees is still alive in spite of my newbie errors. This week I took out the large feeder and replaced it with two smaller feeders. Now the temperatures are back down low, and so I have to wait until the next warm day to repeat the process. I wish I could have gotten a sharper picture, but I have problems taking pictures when wearing gloves. 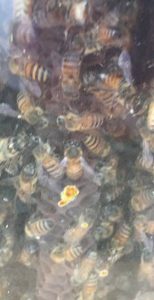 The up side is there are many bees and they even have begun to build a cell for growing a future queen…. I think it is new because I don’t recall seeing it before. So we have had a good solid several day freeze which will help with the annoying insects next summer and it may help with the wildflowers that seem to need some harsh weather before they spring to life in the early months of the year. I need to hurry and build my second hive so I can make a split when the bees start making new queens! I love how cold this winter has been, and am also eager to leap into spring. I marvel at their resiliency. This is a strong colony and I hope strongly that I can do better by them in the next year. Dear Lord, Thank You for bees and the privilege of tending this colony. Please bless them and help me be on top of things this spring and make the right decisions. +Amen. I am grateful for being able to go to the doctor and get an antibiotic. I don’t know what the problem was but the antibiotic has helped considerably. Oddly enough the swab showed nothing, but I most certainly was not well! Oh well, it is behind me and hopefully I will soon be all the way up for making a practice video. My main voice, Goody Goodfellow, is almost himself again. Been struggling with Luther but Calvin seems to be settling in OK. Kleetus is glad to be whining away again and I am still not sure what he is going to end up looking like, and I am having an argument with a robot voice because he isn’t a robot but thinks he is. So GLAD to be able to work on my drills again. Everything got rusty while I was laid up, unable to make the voices. Like any instrument, the voice needs to be used with intention, and the skills must be practiced. I’m horrified by the ground I have lost in mastering each unique voice. On the other hand, my ability to switch between my voice and Goody’s voice seems to be progressing and I think I found Kleetus’ voice slightly faster than before. Now I need a script, or rather several chunks, to work up an act! I feel I am ready to begin to work on more than one character at a time. At any rate, I need to practice something! Dear Lord, thank You for modern medicine and getting my voices back. Please help me to progress in my practice to ever greater levels of mastery. +Amen. My word or theme for this year is SILENCE. I know I’m a bit repetitive but the experience has me thinking a lot about the need to cut out some of the noise in my life that keeps me from being present in my own day. I like to be more aware of my own emotions and those of my family. I like to be relaxed and able to connect with them. Last year was a very noisy year and so I am over-whelmed. This needs to change. Oddly enough, blogging is part of getting away from the noise. A blog can be a very quiet place. Not many people go there. Rarely is there a comment. This is all OK. The reason for the blog is to meet the page with words. To think out loud on paper, virtual paper, but still a blank page. Limiting when I check out my social media. I don’t miss anything by not visiting. The pictures of my grandkids will still be posted. I’ll see them first when I log on–I don’t have to hover on the computer waiting for them. This week I failed to blog each day. It was OK. I spent more time communicating with my children at home. Well, actually, the kids and I have had a couple of shouting matches, but I also got to discuss eggs with my little chef, who is eager to master the art of the hard boiled egg. I heard from the youngest that the large block beads are no good strung but work well for towers. The little beekeeper is full of drama and not yet a teen. Not quiet exactly, but connected. I read a book and finished reading another this week. I manage more real life with less time wasted online. Email takes the same amount of time doing a days worth in the evening as it does when the evening is the third session. I delete most of it without reading it so why not do it all at one time? I also turned off the music and the videos. Turned off a fan that was loud. Amazing how nice it is without all that going on. I hope I can remember Silence the entire year. Dear Lord, thank You for silence. Please help me to keep the commitment to Silence every day. +Amen. My new buckle is very pretty. My new buckle would not be out of place in 10th century Byzantium. My new buckle is waiting for me to add the belt. 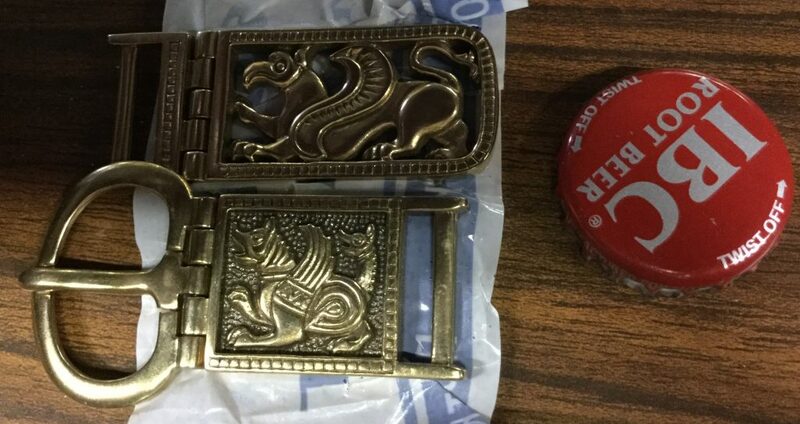 My new buckle is going to look awesome worn with my favorite dresses, modern and period! As you can see from the bottle cap, this is a small set of belt ends. I am contemplating using some trim to make a belt, but I also think it might do better with leather. At any rate, it is beautiful and I am eager to make up my mind. Dear Lord, thank You for beautiful buckles for belts. Please help me finish the project soon! +Amen. My puppets sit silent. This bug has ravaged my throat and I am lucky to be able to speak. Today, Saturday, on the Epiphany of the Lord, I will not make Mass, and certainly will not sing. I will strum on my autoharp and try a few new songs. I will hope to be well enough to get to dance class on Monday. I will pray the antibiotic works. 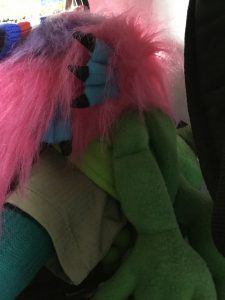 This really SAD picture is of my pile of soft puppets, in a heap, waiting for me to recover enough to get back to them. I haven’t dared to pick them up and straighten them out because I don’t want to contaminate them. Goody hasn’t been out of his box since before the whole “cold” started. Today I will help the Little Beekeeper to finish her letter to her 2018 pen pal. I do hope we do better than last year when she began to fight me about doing the letters in August. Still, she dictated a letter to her 2017 pen pal, catching her up and hoping she might still keep in touch with her and the new Pen Pal is another person to get to know. I will cuddle the Littlest Helper who is suffering a cold. I will seek out the middle child for attention and listen to what he says. In spite of the voicelessness, 2018 is starting out on a good foot. I put the budget on a zero sum shape, so every penny is going where the plan sends it. Debt is nearly retired, and the budget is realistic, enough is in each pot that needs should be covered correctly. I spent all of 2017 making and re-making my budgets, evaluating where each month went wrong and determining the ACTUAL amount of money used in each category. So far I am on day 2 of not buying ANYTHING off Amazon. No shopping, not for anything! The biggest budget buster for me is books. I am not even going to amazon to LOOK at anything until after Easter–and day two is looking good! I think everyone struggles with managing their money. I am convinced that it is possible for us to do better. I want to be truly and confidently in control of my cash. I want to, as a friend said the other day, drive my own bus. There is a book along those lines, which was one of the last purchases I made before I realized that part of SILENCE is to quiet the noise of over-consumption. To decrease the power of advertising by refusing to buy anything. I increased the food budget, and removed the book budget. Credit cards are zeroing out, and their only use is convenience and only on what is budgeted! I am not making resolutions. I am implementing steps toward goals. Dear Lord, please help me to stay the course, to control the budget and refuse to allow it to be violated by unplanned purchases. Help me to listen to the children and meet them where they are. Help me to get well and get to dance. Help me get well and return to working on my puppetry +Amen. Silence is my word for this year. Last year was Faith, the year before Hope. I wondered what word to choose and it jumped out of an article at me. I ought to blog on that…but for now looking at results. 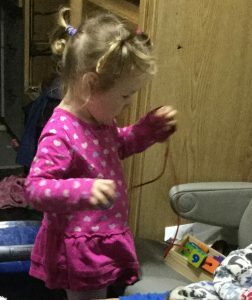 The youngest is settled on the carpet with a pony that is a unicorn with bright colored mane, talking to the toy, moving it about, lost in some imaginative play. I cannot make out any actual words. Just a conversational babbling. The youngest has blocks. Actually they are drilled for stringing on chord to practice motor skills. “I’m building a bridge.” and much sing-song babbling. The stack falls and there is, “oh no!” and still more happy babbling. This silence thing is going to make this year especially good. Everything is off more than on. I’m looking at nothing but the blog and Nineveh 90 for the prayers. I am feeling more connected to the world around me today. It is nice. I am at risk for getting repetitive. I think now that avoiding being boring is a reason to have a planner for the blog! I’ve watched these youtube videos about planners and several of them have more than one planner. I was rather taken aback by their need for multiple planners. I’ve always used one. However, yesterday I wanted somewhere to write down something on school, and found nowhere to do it. Then today I think how I probably need some sort of means of keeping track of what I have written about in this blog. I am noticing that with daily blogging, most of which is simply my own meanderings, I’m using the written journal less. Probably just as well, nobody was going to ever read that mess anyway. Of course, I’m not expecting people to be all that excited about this blog either. I needed the discipline of daily writing, and it seemed a blog was a good way to do that. Dear Lord, thank You for 2017, thank You for 2018. Thank You for the internet and blogs and v-logs. Thank you for my children. Please bless my children and my whole family. +Amen.